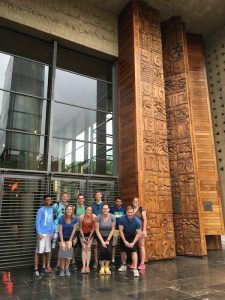 With all of the site visits complete, the weekend was filled with cultural activities. We began our last full day with a trip to Constitution Hill. Constitution Hill is the home of South Africa’s Constitutional Court, which is similar to America’s Supreme Court. We soon learned that the court was built on the site of the Old Fort Prison Complex, also known as Old Fort or Number Four. 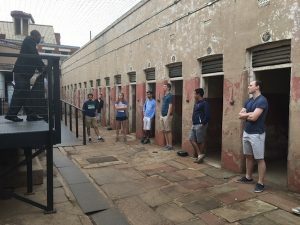 Before learning about the current purpose of the court, we were guided around the premises with a tour guide that depicted what the prison was originally like. The prison was built in 1892 for black prisoners. In 1896, it became a military fort to protect the republic from a British invasion. But in 1900, they fell to the British; thus, making this area a prison once again in 1906.There were three kinds of prisoners kept in Old Fort Prison – criminals, common law prisoners, and political prisoners. The common law prisoners stayed at this prison from 3-12 months; these were the people that broke some of the Apartheid rules. The political prisoners/activists were thought as communists or terrorists since they were the people that were going against the current government system. These three times of prisoners were split up not only by level of crime but also by race and gender. This prison was extremely harsh. The inmates faced brutal beatings and were highly malnourished. We gathered around a table and learned about the diet of each inmate. The diets were restricted based on race – white, colored/Asian, and African. Here, we had a long discussion of how much food we each eat on a daily basis and compared it to the amount a prisoner would get at each meal. The difference was shocking. Only whites were allowed meat and, Africans were given a type of energy drink since they had to perform physical labor at the prison. There were even three different types of pots where the food was cooked called Congress One, Two, and Three. Each pot was for a different race, with the amount of protein slowly restricted. The prison was not only to punish the inmates, but also to humiliate them. The guards’ goal was to have the prisoners lose their dignity. This was especially true in Number Four. This was the most brutal area of the prison. Most political prisoners were kept here. Number Four was built to hold 800 or so prisoners, but as the Apartheid laws grew rapidly and political activists multiplied, this area held over 10 thousand prisoners at one time. Number Four was used to punish the prisoners not to rehabilitate them. This area consisted of a row of cells where prisoners were kept in complete isolation. No talking was allowed. These cells are shown in the picture above. During our tour, we all lined up in front of a door and on the count of 3, got into our cells and closed the door. We stayed behind these doors in complete silence for 23 seconds. Each of these seconds represented an hour of the day for a prisoner. Number Four prisoners were locked up in their cells for 23 hours a day. The prisoners were not supposed to stay in this area for long, but some did for up to 12 months. Most of these prisoners died from malnutrition or from drowning, due to Johannesburg’s strong rains and the cells on the bottom slope of the prison. After learning about the harsh conditions these prisoners endured, we then switched to learning about the Constitutional Court. The court was established in 1994 in the Old Fort and in 2004 moved to the current location of where it is in the prison. The court itself reflects a lot of symbolism. Some of the bricks of the prison buildings were used to build the new court, in order to represent the change from Apartheid to Democracy. The court is a very open building with many windows as to be transparent where nothing is hidden in the court. As we walked into the building, we were welcomed through two large wooden doors. These doors are shown in the first picture. These doors are carved with numbers from 1 to 27, each representing 27 basic human rights. They begin with 1 being equality, all the way to 27 which are rights to protect prisoners. These doors symbolize the court’s goal of dignity, equality, and freedom. 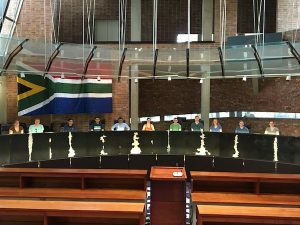 Inside, we walked into the courtroom and were briefed with information about the judges, the South African flag, and some of the most controversial cases that were discussed in this courtroom. Before we left, we of course had to take a picture in the judges’ seats, as shown above. The second half of our day began with a drive to the township of Soweto. Here, we went on a bike tour to explore the township. Before the trip, we got in line for some lunch. 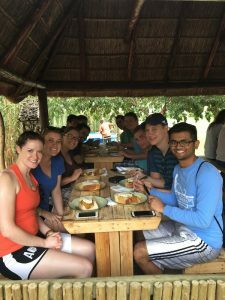 A traditional meal of “Bunny Chow” was served, which was a large piece of bread that was cut in half filled with a stew of beef, sausage, chicken, or vegetables. It was delicious and just what we needed to fuel up for our tour. After lunch, we each chose a bike and then we were off. After a few minutes of riding, our tour guide pulled us to the side, where we dismounted our bikes and got an introduction. N.K., our tour guide, discussed the area that we were in. Soweto stands for southwestern townships. He explained that Soweto is 130 square kilometers large (about 50 square miles) where over 3 million people live. The township is divided into 38 smaller suburbs. 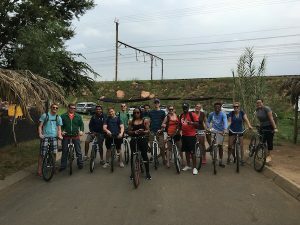 We were informed that we would experience drastic area changes as we biked, due to the three different social classes that were prominent in Soweto. As we biked along, we could easily distinguish the different areas. We biked through neighborhoods that had community sinks and baths. The houses were shacks and lots of people walking around. Even in an area like this, the children were running and laughing and waving to us hello. It was a surreal experience for most of us. We also biked around areas where the higher classes lived. We passed by Nelson Mandela’s house and even Archbishop Desmond Tutu’s home. Once we finished the tour, our final destination was a little fire pit next to where we started. We put our bikes back and all circled up. A couple of our GLCM team were clothed with traditional African head pieces, and we all passed around a ceremonious drink to complete our tour.